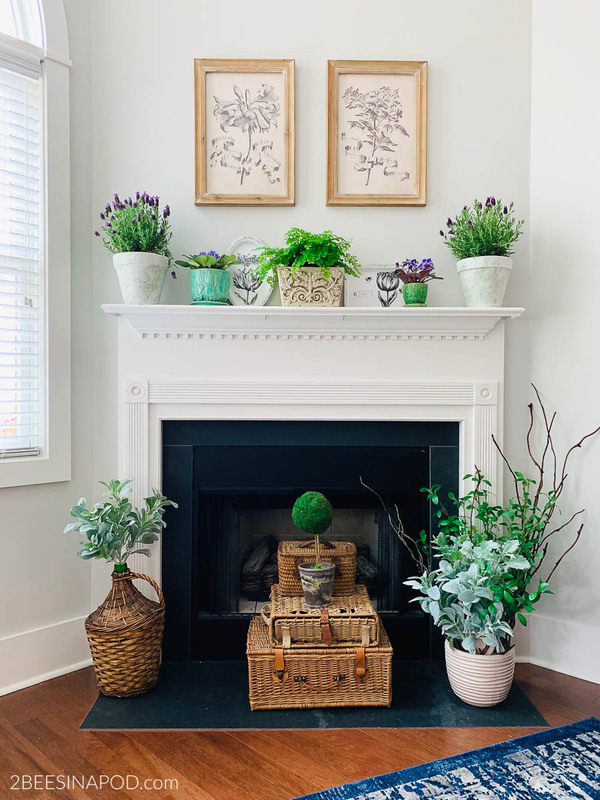 We believe that this vintage botanical spring mantel is our most favorite yet! 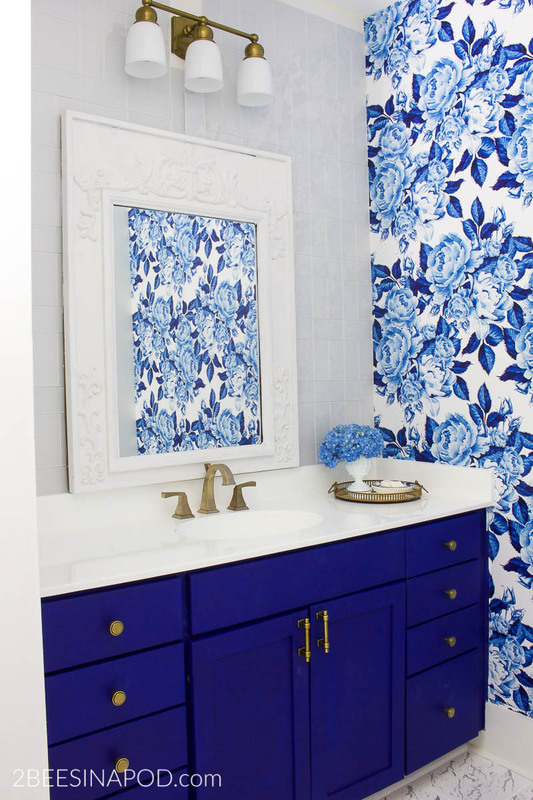 Sometimes home decor ideas come together effortlessly. 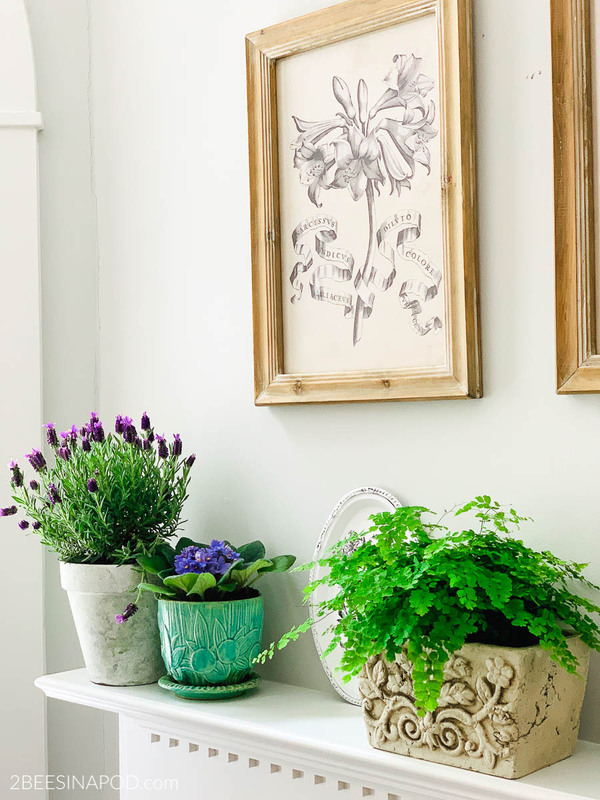 That’s how this vintage botanical spring mantel is. We wanted it to feel like a garden shop met an antique shop of sorts. Come on in and take the tour! 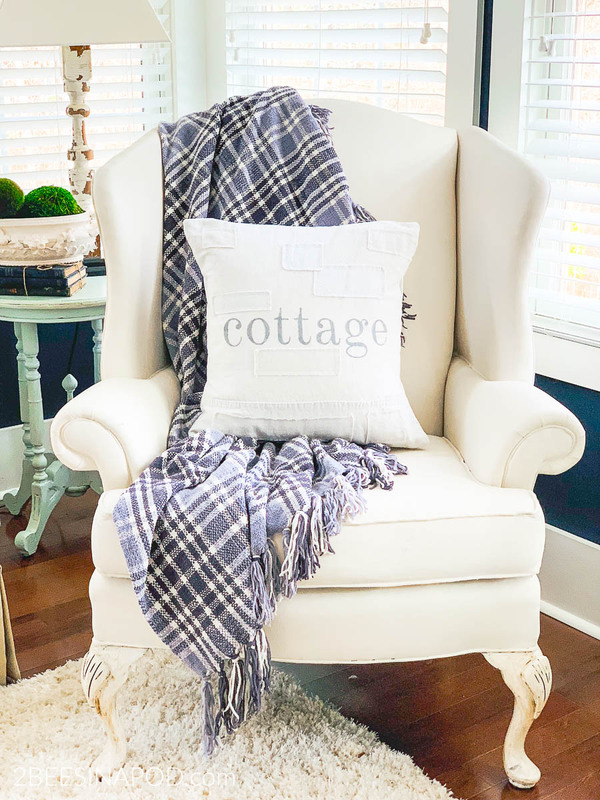 Our sweet friend Amy of White Cottage Home and Living has arranged this Spring Mantel tour. 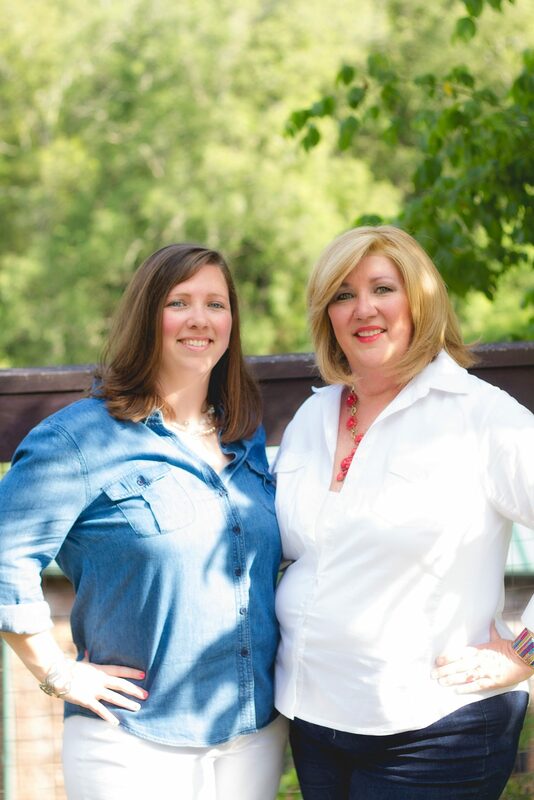 We are so ready for some fabulous Spring weather and gardening. Obviously, some of you are still knee-deep in snow. We are dreaming of blue skies, warmer weather and gorgeous flowers. How about you? The vintage botanical theme came about so organically. 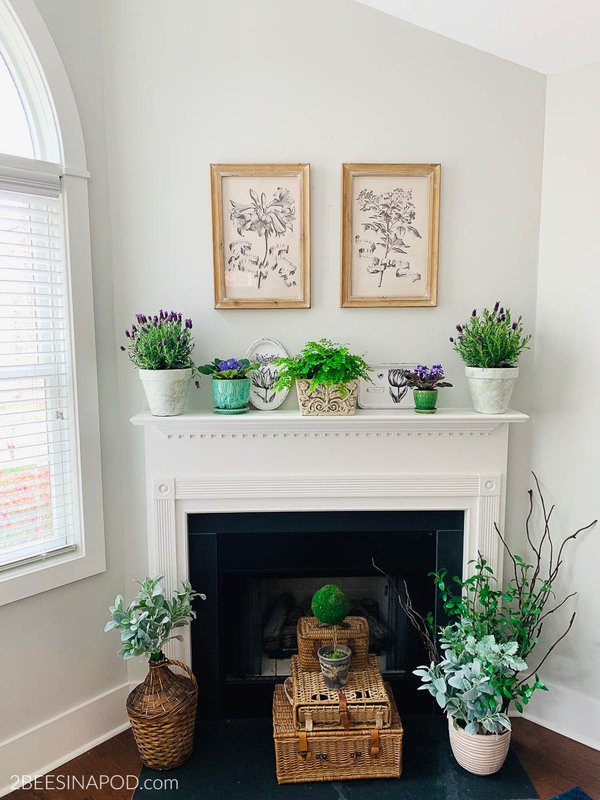 A couple of months ago we scored these beautiful framed prints for just $18.00 each.Originally the prints were purchased for a master bedroom refresh. For now, they look great hanging above the mantel shelf. 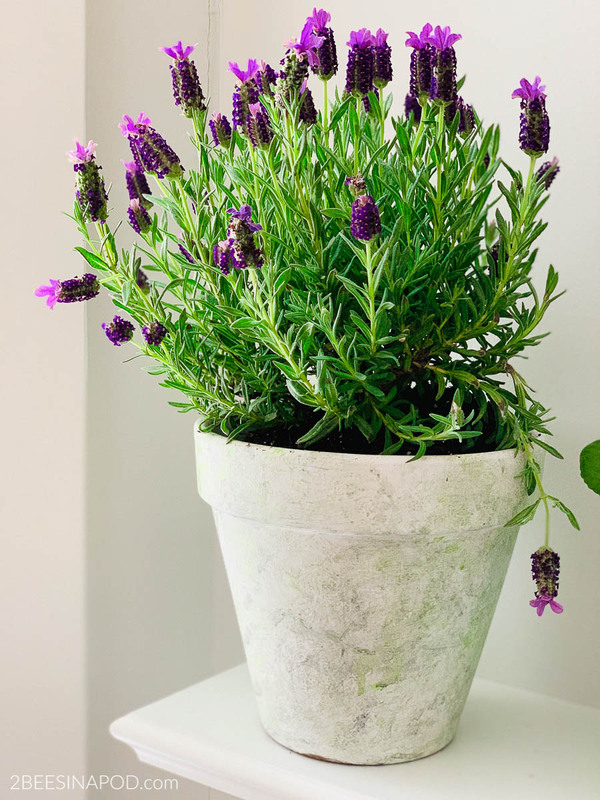 Lavender screams of spring, don’t you think? 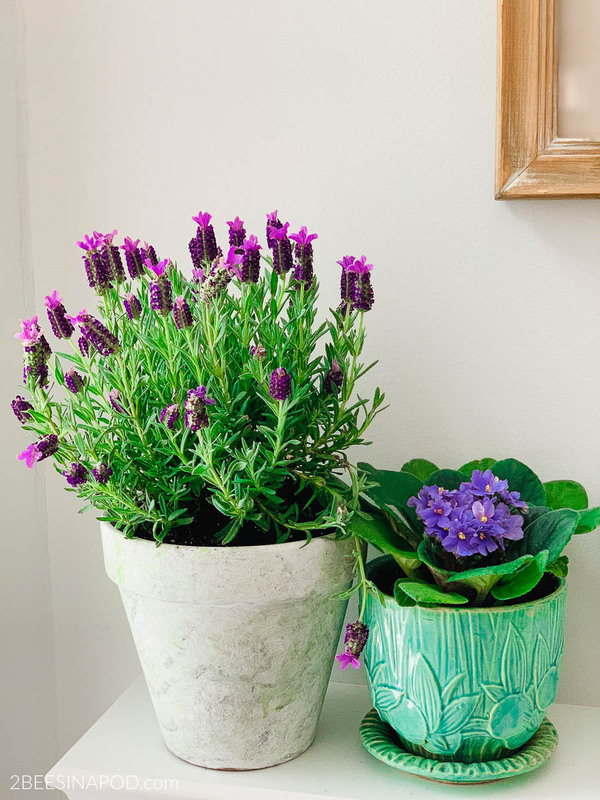 When paired with african violets they are a dream team. This concrete planter was a thrift store score for just $3.00. 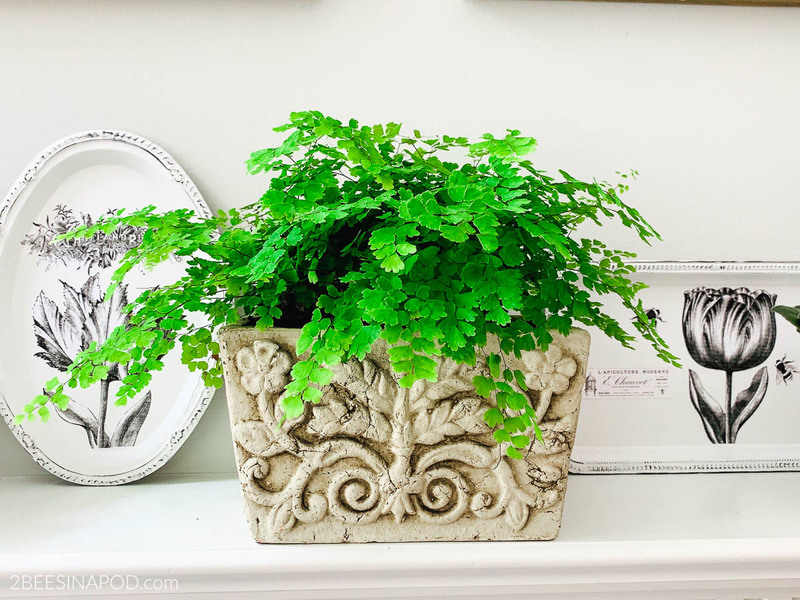 We think that the maiden hair fern looks beautiful planted inside. 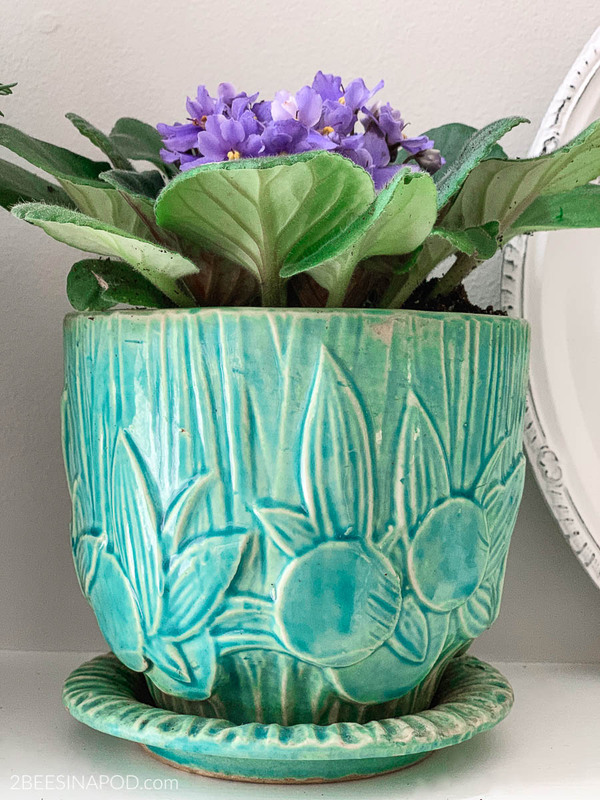 The african violet pots were inherited from Vicki’s grandmother. Admittedly, Grandma Tritt wasn’t much of a domestic, but she could grow african violets and lots of other plants. An endearing memory is grandma pulling off a leaf of her plant and showing us how to place it in a cup of water until it sprouted roots. She told us to bring it back to her, and then she taught us how to plant it. We felt so grown-up. 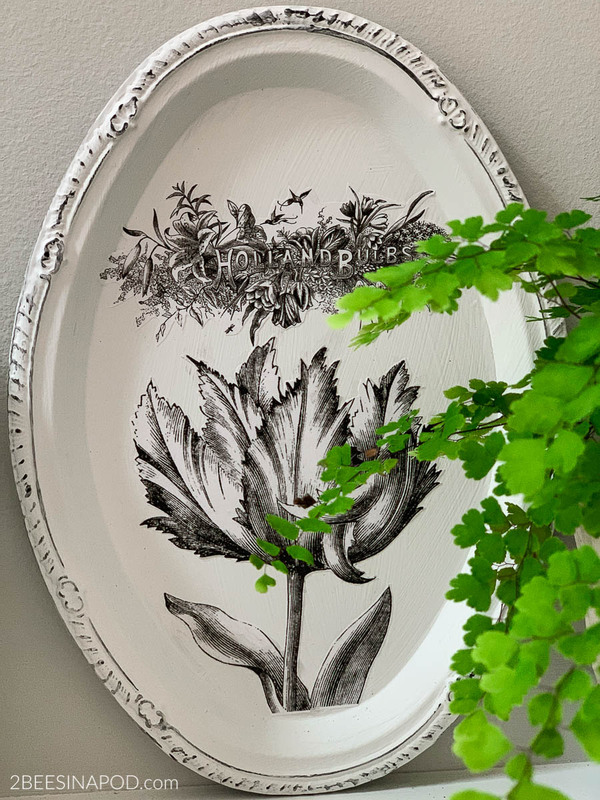 A couple of weeks ago, we shared our idea for these pretty chalk painted trays with French graphics inspired by the Dollar Tree. Also, remember our crazy idea for DIY moss balls from a Dollar Tree ball? 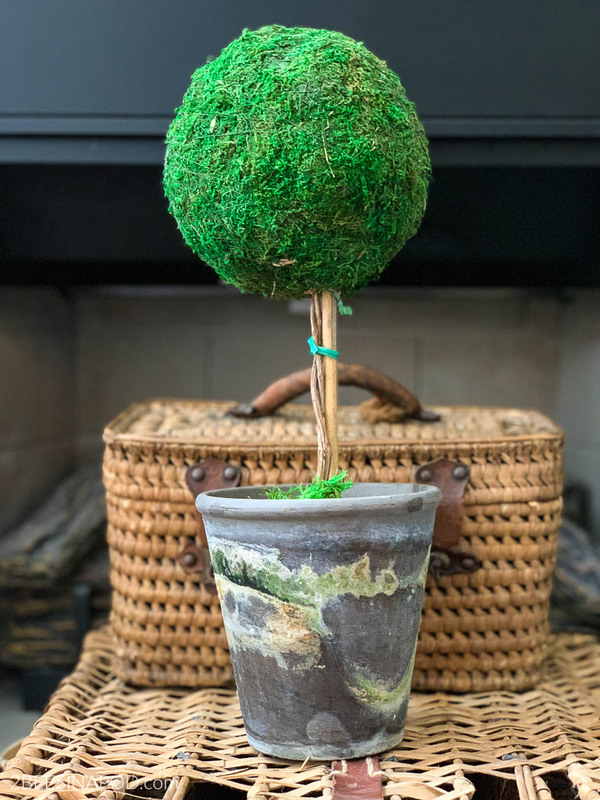 They are extra large moss balls and so easy to make. We made another one with sheet moss and made it into a moss topiary. 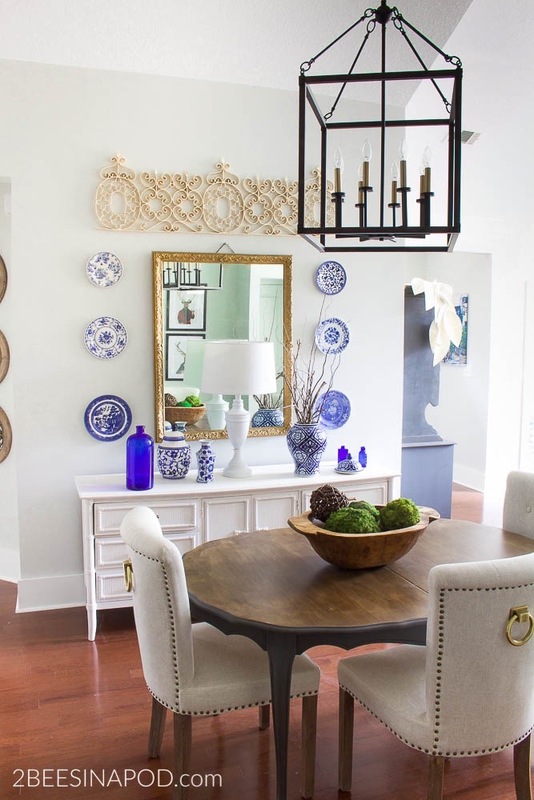 We are so fortunate to have an antique wicker demijohn collection. Thankfully we started our collection before they became so popular and expensive. 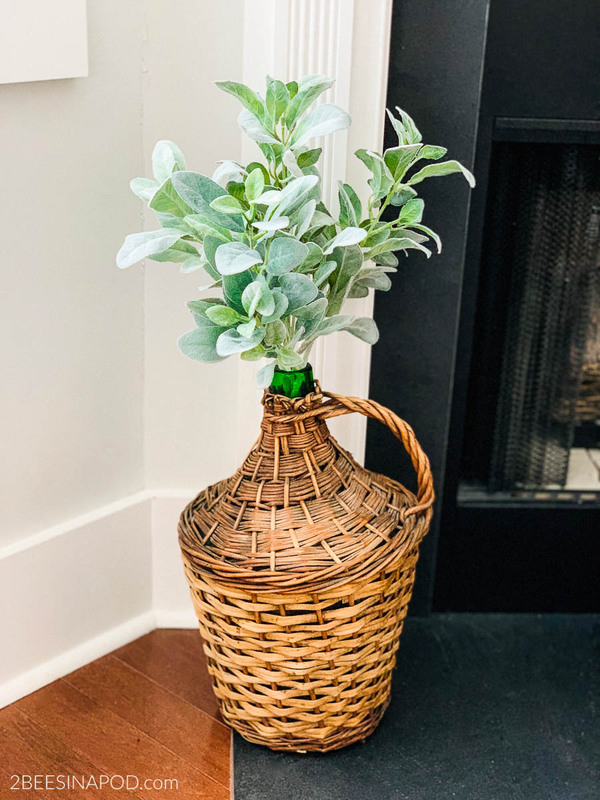 For Spring we added these pretty faux lamb’s ear stems. 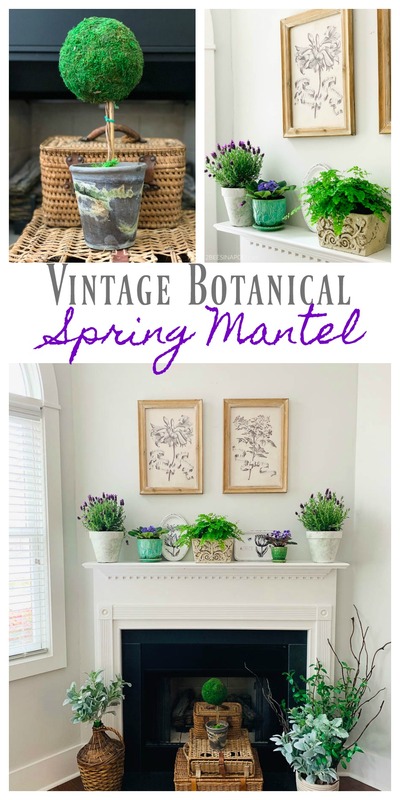 Hopefully, you love our vintage botanical Spring mantel as much as we do! 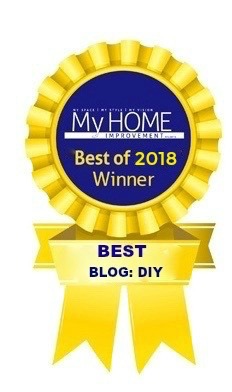 Now let’s see what our friend’s mantels look like! Just click the link at the end of our post! Just gorgeous! 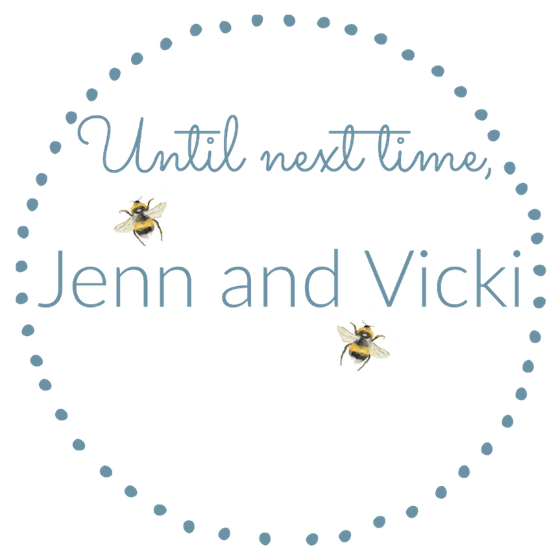 Vicki and Jenn, you both are so talented. Thanks for sharing! 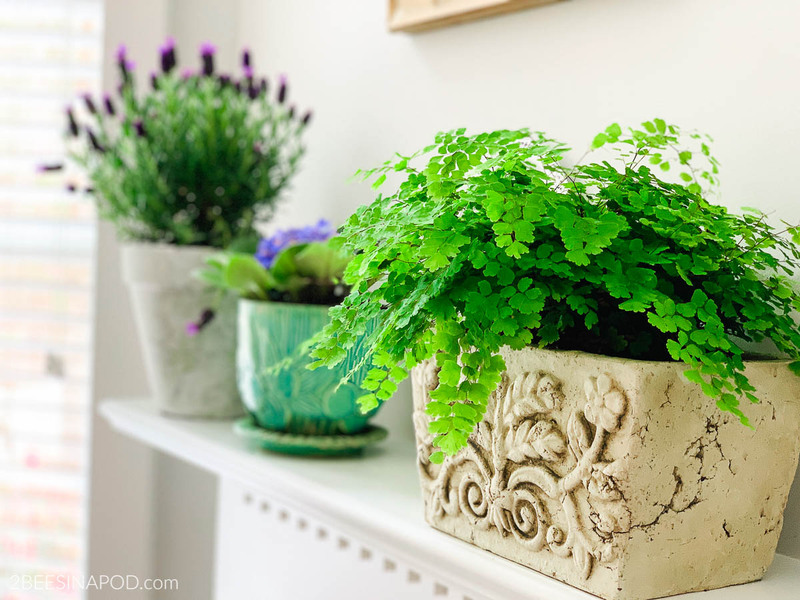 I love your mantel this spring! Just beautiful. It has all the spring touches and the real flowers and plants make it feel so fresh and alive. Thanks for joining us!